The Fitness Center will be CLOSING at 6PM starting Monday, March 11. 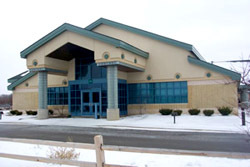 View a 5 minute video showing what the Nimkee Fitness Center has to offer Tribal members and Tribal employees: For Windows Media files, click here. Membership is available to all Saginaw Chippewa Indian Tribal Members and all employees free of charge. Fitness Membership includes access to all equipment, instructional classes, fitness evaluations, program set up, incentive programs and locker room facilities. Fitness Evaluations This includes body composition ( skinfold measurements), body weight, blood pressure, grip strength, muscular strength, blood sugar and cholesterol testing. Also free personalized exercise program set-up and training sessions for any client upon their request. Strength Training consists of Cybex Resistance machines, Power Rack & Smith Machine, 4 multiple position benches, multiple weighted curl bars, dumbbells weighing from 2 lb. to 100 lbs., medicine balls, resistance bands, weighted body bars, and weight vests. Cardiovascular Exercise consists of 6 treadmills,5 stationary bikes,3 stair climbers,2 versa climbers, Reebok Body Trec, Stairmaster Step Mill, 2 Concept II Towers, Jacobs Ladder, Nu-Step TRS 4000, heart rate monitors, and a Stairmaster kayak machine. Classes Instructional classes are free to members including Aquatics for Tribal Seniors, Basic and Advanced Step & Sculpt, and Yoga Fit class.